← It’s David Gan again. Son of a Gan! MH370: No. They DON’T believe Najib. Some called him a liar! *H370: China’s Chinese are GRIEVING, DISTRUSTING AND FURIOUS! OUR PM DOESN’T RATE HIGHLY. AUSSIE PM DOES. Malaysia Prime Minister Najib Razak (left) looks at Australia’s Prime Minister Tony Abbott as he speaks at a breakfast with crews from nations involved in the search for wreckage and debris of missing Malaysia Airlines Flight MH370 at RAAF Base Pearce near Perth today. Najib visited the Australian search base for missing Flight MH370 today as a nuclear-powered submarine joined the near-four week hunt that has so far failed to find any sign of the missing airliner and the 239 people onboard. – Reuters pic, April 3, 2014. The tragedy of missing Malaysia Airline MH370 has portrayed Australian Prime Minister Tony Abbott as a compassionate statesman – a stark contrast to the approach by Malaysian Prime Minister Datuk Seri Najib Razak, said a CNN news commentary. “While Najib Razak sanctioned sending a text message to families informing them that the aircraft had likely ended up in the southern Indian Ocean, Abbott told the families of the six Australian passengers on the flight the country had ‘an ache in its heart and nothing we can say or do will take that ache away’,” award-winning journalist Monica Attard wrote in the commentary. On March 20, Abbott put Australia and himself into the limelight when he told the Australian Parliament that new satellite images had shown what might be aircraft debris in the Indian Ocean, some 2,500km off the coast of Western Australia and that an Australian-led search party would be investigating. “Abbott made international headlines. Statesmanship peaked out from behind the curtains,” Attard wrote. She said that when days later no debris had been found, Abbott deflected criticism that he had jumped the gun, saying the search area was about the most inaccessible spot that you would imagine on the face of the earth. He gained public support, Attard wrote, when an informal poll in the Australian daily Sydney Morning Herald showed that many thought Abbott had acted properly in announcing news of the satellite images and that his compassion was “perceived as real rather than political opportunism”. Attard praised Abbot’s determination to deliver “closure” for the families of those on board the jetliner stands which she said was in stark contrast to the approach of his Malaysian counterpart. She also highlighted Abbott’s compassion in waiving visa fees for the families who wanted to go to AiAs the Australian-led search mission entered its second week, Abbott told grieving relatives what asylum seekers trying to enter Australia have never heard. Attard said even Abbott’s most fervent enemies would have to concede that he had been both eloquent and diplomatic in the expression of his sorrow and grief for those who do not know if their relatives are by some miracle still alive and if they are not, and what caused their deaths. “But the same fervent enemies might also question whether Abbott sees an upside to statesmanship and compassion. “Tragedies of the scale of MH370 are rarely used for political gain without the real and imminent danger of significant political cost. But such tragedies can soften images, turn skeptical minds and give hope to those who’ve not been recipients of an open heart,” Attard wrote. *DID NAJIB SAY THAT MH370 HAD CRASHED? Read the words again: flight MH370 ended in the southern Indian Ocean. THAT, IN SIMPLE ENGLISH, MEANS THAT IT IS in THE OCEAN. CRASHED INTO IT, LANDED IN IT, FLOWN INTO IT…IT STILL MEANS IN THE OCEAN. “He (Najib) said that based on analysis, Inmarsat and AAIB concluded that MH370′s last position was in the middle of the Indian Ocean. “He also said that it was a remote location, far from any possible landing sites. “However, there was no mention of a crash or that there were no survivors at all,” said Hishammuddin. THEY HAVE ARRIVED AND THEY MAKE THEIR VOICE HEARD! The Acting Transport Minister says that his cousin only stated that MH370’s last position was in the middle of the Indian Ocean. PETALING JAYA: Acting Transport Minister Hishammuddin Hussein today defended Prime Minister Najib Tun Razak on the latter’s announcement made last week on the fate of missing Malaysia Airlines Flight MH370. Responding to a question posed during today’s daily briefing, Hishammuddin said that claims of the plane having crashed was “totally erroneous”. Acting Transport Minister Hishammuddin Hussein today took a grilling from the international press as Malaysian authorities continue to be tight-lipped about details of investigations 24 days after Malaysia Airlines Flight MH370 went missing. However, Hishammuddin, who is also defence minister, refused to shed light on the authenticity of various leaked information on the Internet and instead said he will be answerable to various inquiries that will be set up in future. 1 hour ago – Some 37 families of Chinese passengers onboard MH370, who arrived in Kuala Lumpur today, are demanding for an apology from Malaysia. 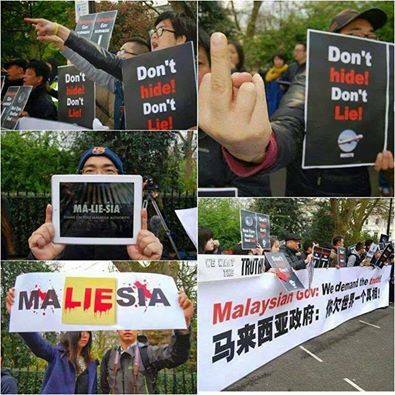 They accused Najib of being a liar and demanded that he retract his announcement on the fate of MH370. Relatives of the Chinese passengers aboard MH370 have demanded that Prime Minister Najib Abdul Razak apologise for ‘prematurely’ announcing that the missing flight had ‘ended’ in the Indian Ocean. They want MAS apologise as well for saying that there were no survivors, claiming that both announcements are without sufficient evidence. After arriving from Beijing today, a spokesperson for the group of 35 relatives held a press conference in Subang at 2pm. “We hope that from here, Malaysian authorities can fully disclose their evidence, and answer our questions. “Secondly, we demand that the Malaysian government apologise for last week’s confused communications and for holding up the search and rescue effort. “Thirdly, we demand that the Malaysian government and MAS apologise for irresponsibly saying that the aircraft is destroyed without survivors without a shred of evidence,” Jiang Hui told reporters. Relatives of passengers on board missing Malaysia Airlines flight MH370 leaving after attending a briefing at a hotel in Subang Jaya today. About 35 family members are in Malaysia to seek answers as the search for the missing Boeing 777 enters its fourth week. – The Malaysian Insider pic by Najjua Zulkefli, March 30, 2014. 3 Responses to MH370: No. They DON’T believe Najib. Some called him a liar!